Thanks, Mail Carrier is having a wonderful giveaway that I thought I would share! 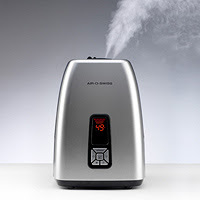 She is giving away an AIR-O-SWISS 7144 Digital Warm & Cool Mist Ultrasonic Humidifier. Yes, that is the swanky looking humidifier in the picture. Go here to read her review and enter.